Commodity futures trading has suffered in the wake of the NSEL scam, and MCX is hurting the most. Scams and uncertainties have spoiled the party in the commodity futures market , and the worst sufferer is the Multi Commodity Exchange (MCX). The exchange's turnover has plummeted by 69 per cent since April 2013. Although it is still the biggest player, it has been losing market share to rivals in the current financial year. According to its website, MCX had a market share of 87.3 per cent in terms of the value of commodity futures trades in 2012/13. Data from the Forward Markets Commission - the regulatory body for commodity futures trading - shows that MCX had a market share of 89 per cent in the first fortnight of April 2013, and this shrank to 75 per cent by the end of December. In the same period, nearest rival National Commodity and Derivatives Exchange (NCDEX) more than doubled its share from 8.75 to 19 per cent. The third largest player, the National Multi Commodity Exchange also moved up, from 0.76 to 2.54 per cent. Also during this period, the total turnover of all commodity exchanges fell from Rs 787,433 crore to Rs 292,292 crore. The trend suggests a shaky future for commodity futures trading, which is still in an early stage compared to equity markets. The greatest drop has been in bullion, for which the value of trades fell from Rs 384,511 crore to Rs 108,919 crore. Experts attribute this to tightened gold import norms, which reduced the need for hedging. Metals other than bullion slid from Rs 131,342 crore to Rs 45,880 crore. The impact on agricultural commodities was comparatively mild, as they fell to Rs 77,828 crore from Rs 85,853 crore. The decline on MCX is partly due to the 0.01 per cent commodity transaction tax (CTT), imposed since July 2013 on all non-agricultural and some agricultural commodities. Unlike NCDEX, which is primarily driven by agricultural commodities, MCX draws a larger share of its revenue from metals. The decline can also be attributed to the National Spot Exchange Ltd (NSEL) scam, which hogged the headlines by late July 2013. Financial Technologies (FT), led by Jignesh Shah , is the promoter of both NSEL and MCX. NSEL suspended trading activity on most contracts on July 31, 2013, and failed to settle outstanding contracts worth Rs 5,600 crore, leaving investors in a fix. A detailed investigation by the police and regulatory agencies followed. Commodity markets face challenging times, says Samir Shah, Managing Director, NCDEX. "Imposition of the CTT has had a major impact," he says. "Further, price bearishness was seen in the agricultural sector. This could have led to poor sentiment in commodity trading. In addition to the impact of the CTT, the events that unfolded in the NSEL case shook investors' confidence in commodity futures markets." However, corrective measures by the Forward Markets Commission are expected to help revive the market in 2014, Shah adds. The NSEL crisis has only worsened with time. The exchange has defaulted on payment schedules 21 times. The Forward Markets Commission has declared FT and Jignesh Shah not "fit and proper" to run MCX (the order has been challenged in the Bombay High Court), and the Economic Offences Wing has attached Shah's properties. 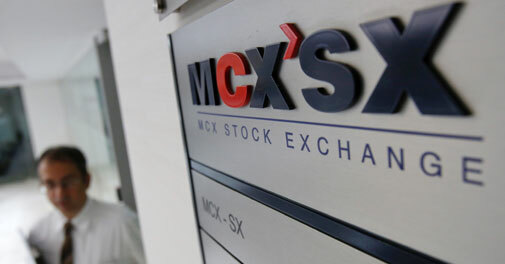 The Commission has directed FT to trim its stake in MCX from 26 per cent to two per cent. Some say a process of cleaning up has started and things are likely to improve. The Forward Markets Commission maintains that FT has violated rules at MCX, and is keen to see Shah's exit from the bourse in the interest of other participants. The Commission says FT violated the directive that prevents shareholders from having a trading interest in the exchange. The Indian Bullion Market Association, in which FT-owned NSEL had a 60.88 per cent stake as of March 2013, traded at both NSEL and MCX, in direct violation of government rules. The Commission raised questions about corporate governance at FT in findings that were made public on December 18. It says that the declining volume of trade at MCX in the wake of the NSEL crisis indicates "erosion of public confidence". Responding to queries by Business Today, MCX said there was a decline in turnover after the CTT was introduced, but now there are signs of improvement. It says its daily turnover has improved from an average of Rs 17,355 crore in December 2013 to around Rs 23,000 crore in early January 2014. 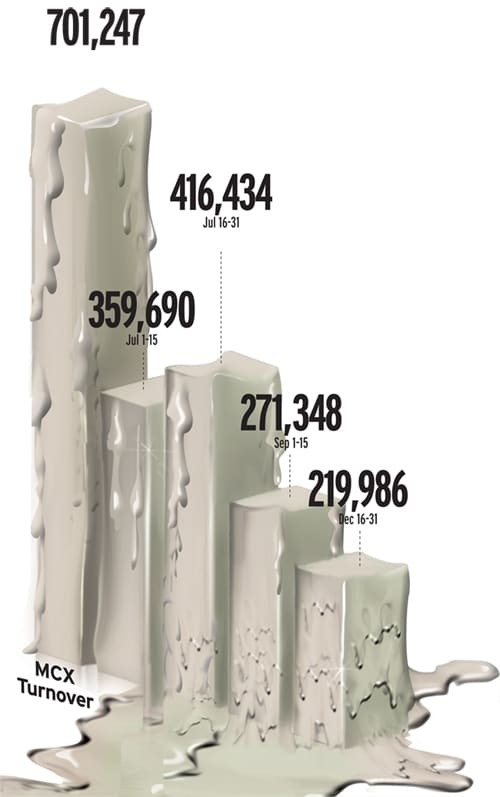 But this is still well below the daily turnover of Rs 51,000 crore in April 2013. Nonetheless, MCX maintains that market sentiment is improving, aided by the removal of additional margins on trading in bullion, base metals and energy. A response from the exchange says: "The market regulator is looking at several steps to revive interest in commodity futures market."